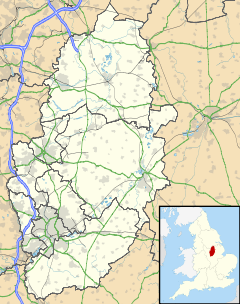 Warsop is a civil parish in the District of Mansfield, Nottinghamshire, England, on the outskirts of Sherwood Forest. At the 2001 census it had a population of 12,365, reducing to 11,999 at the 2011 Census including Church Warsop, Meden Vale and Spion Kop. The parish holds an annual carnival traditionally scheduled on the first or second Sunday in July. The carnival was expanded to include the preceding Saturday to be used as a sports day and music festival. The event is held on The Carrs playing fields, just off the main A60 road. Warsop watermill was built in 1767 and restored in 1924. Warsop windmill, first called Forest Mill but also later known as Bradmer Mill, was a stone-built tower erected in 1825. It was 28 feet high with three storeys, a fourth storey being added later in brick. The mill had four sails, two of which were blown down by a gale in 1910, after which the mill was worked for a short time on the two remaining sails. By the 1920s the mill had lost all its sails and its cap. The tower is a Grade II listed building, standing to the southeast of Warsop close to the A6075. In 1930, Samuel Fell Wilson, a Warsop grocer, wine merchant, and publisher of the Warsop and District Almanack, was shot in the head and chest as he sat in his car outside the mill. The murderer was never identified. There is a local road named Fell Wilson Street. Warsop is home to Meden School on Burns Lane, part of a local group named Torch Academy Gateway Trust. Former pupils include television hosts Pollyanna Woodward and Simon Mapletoft, Mansfield 103.2 presenter Jason Harrison, Breakfast Show host Joe Sentance on Rother FM/Dearne FM, ex-Everton footballer Neil Pointon, and England wicketkeeper Bruce French. Warsop railway station operated between 1897 and 1955. There is some ambition for eventual reopening of the line currently freight only between Shirebrook and Warsop. Stagecoach bus 12 runs twice an hour between Shirebrook, Warsop and Mansfield. Stagecoach bus 11 also runs twice an hour between Meden Vale, Warsop and Mansfield, giving Warsop a bus service into Mansfield every 15 minutes. Another bus, numbered 209, runs between Edwinstowe and Worksop via Warsop and Cuckney every two hours. ^ "Area: Warsop CP (Parish)"
^ "Civil Parish population 2011". Neighbourhood Statistics. Office for National Statistics. Retrieved 6 April 2016. ^ Lambourne, Helen (22 July 2009). "New bid to extend rail link to Ollerton". Worksop Today. Retrieved 21 February 2010.